As you can see, talking about the latest edition of Oh Marie! yesterday has inspired today's colour palette theme. 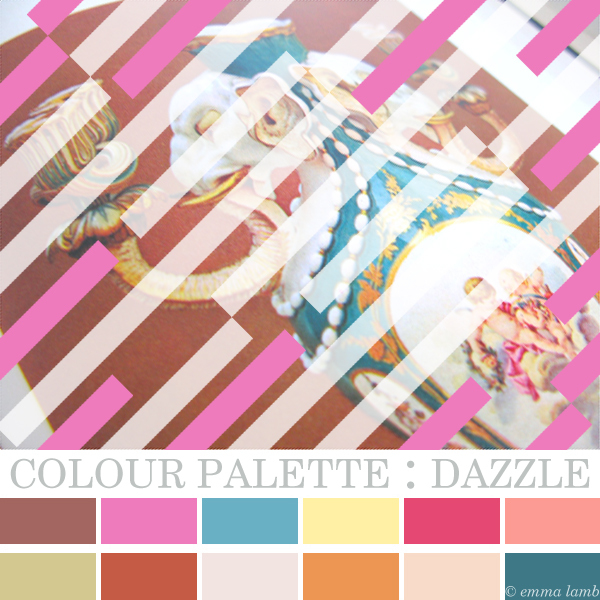 I love the concept of 'Dazzle Painting' (a method of camouflaging ships using complex geometric patterns, mostly used during WWI) and the diy tutorial to up-cycle a vintage painting in Oh Marie! has really stuck a creative chord with me. Thank you Marlous and Wendel for the inspiration! The images I've used are my photographs of one of my current favourite books and thrifty finds - Porcelain by Hugh Tait, printed in 1962. You can read about why I love it so much in my 'Meet the Maker' interview over on Folksy. These images have been hanging around since then waiting for me to turn them into a palette. I've tried once or twice but every time the results just seemed to lack a certain something, you know!? On looking at them again this morning I just new I wanted to draw over them and make them dazzle! I am completely in love with how they turned out. This kind of geometric overlay just seems to work so perfectly on top of vintage imagery. Kinda like 18th century decadence meets eighties pop and somehow they are the best of friends - oh yeah, that was what the eighties was all about wasn't it!? 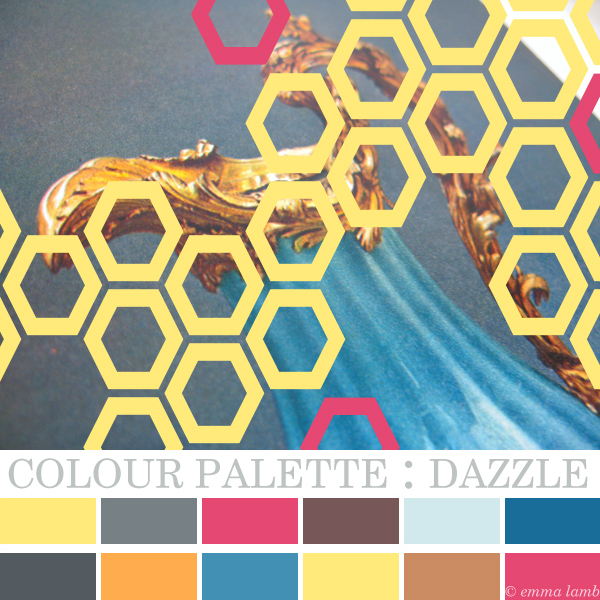 There is such harmony in the colour palettes too. The candy brights of hot pink, cherry red and sunny yellow don't compete with the more muted vintage tones like you might expect, they compliment and enhance each other instead. I feel so inspired by these combinations. 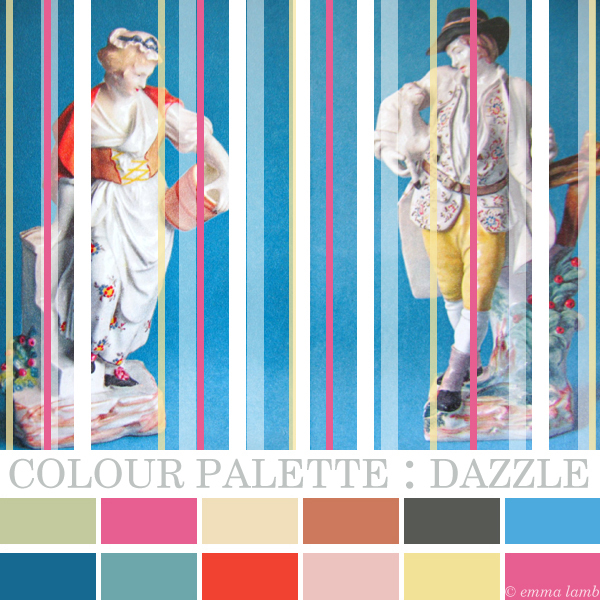 Oh, and the creative process of dazzle painting is so satisfyingly addictive, so no doubt you'll be seeing a few more dazzled images on this blog in the future. ps - who is reminiscing about Blockbusters right now!? Yes, I had a peek at Oh Marie! yesterday and was similarly inspired. I guess you could also call this a Padazzle :) And why were there always two players against one on Blockbusters? I love 'Padazzle'! These are definitely 'Padazzlers' aren't they!? I have no idea, I never got that either! Very, VERY cool images, Emma! Love the bright colors too.